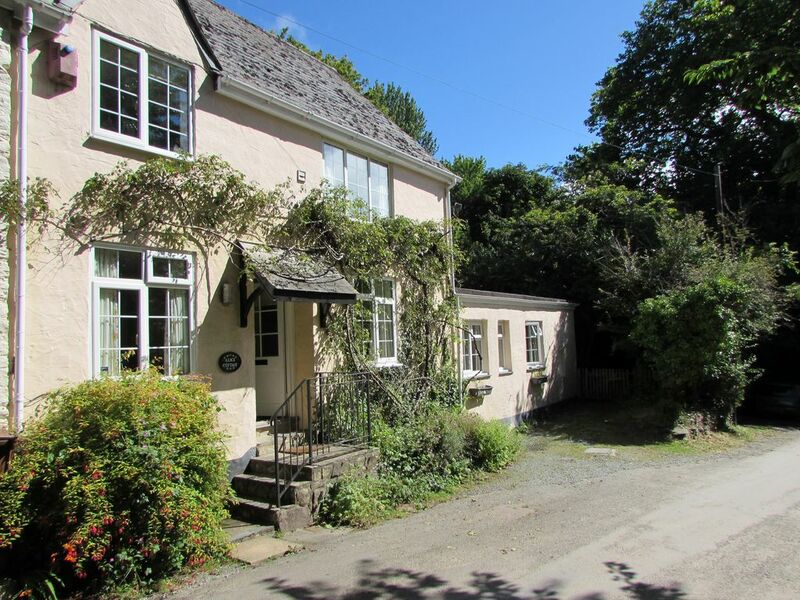 The former home of author A.A. Milne's real life character Christopher Robin, this self-catering cottage is set in a picturesque valley, a 15-20 minute walk down a delightful lane from the famous Blackpool Sands beach with a top Blue Flag rating for water quality. Entrance hall. Ground floor. Double bedroom, en suite shower room, two twin bedrooms and bathroom. Staircase to well-equipped kitchen/diner with beamed archway to attractive sitting room, comfortably furnished. From sitting room french door to patio and BBQ area and 3/4 acre garden maintained as a wildlife garden carpeted with daffodils and bluebells in the spring. The cottage is a 10 minute drive from Dartmouth with its excellent shops, restaurants and galleries. Parking off-street for 2 cars. Alice Cottage provides a wonderful location for a family holiday and is a truly romantic getaway .The nearest dining pub and shop are 3/4 mile away in Stoke Fleming. Nearby Dartmouth Golf & Country Club allows guests to use their leisure club (including indoor swimming pool) and two golf courses at a 25% discounted rate. Alice Cottage has wireless broadband. Would appeal to nature lovers, artists, writers, and families with young children. Nearby Dartmouth has a world famous August regatta, music festival, cinema, excellent shops and restaurants, castle and pottery and tennis courts. The nearest golf course is the Dartmouth Golf & Country Club, 4 miles from Dartmouth. Guests enjoy a 25% discount on green fees on the superb 18 hole 7,200 year championship course and the 9-hole Dartmouth Course. Special rates apply for the driving range. Alice Cottage has a main bathroom located on the ground floor with bath, handheld shower and toilet. The main bedroom has an en-suite toilet and shower enclosure. Alice Cottage is a little slice of heaven in South Devon. My family and I had the joy of spending an entire month in the property. It is tastefully kitted out with all you need for both a short holiday or a longer stay. My children loved the garden, building dens and enjoying make believe games. It's only 15 mins walk to Blackpool sands. Dartmouth is just a short journey up the road. We did some great walks along the SW coastal path. If you need peace and quite or time to reflect this is the ideal destination. We didn't want to leave. This very clean cottage is well equipped with everything we could possibly. The back garden is natural and peaceful. We were delighted to be greeted by scones, jam, clotted cream and wine when we arrived. it would be best to have a small car to navigate the very narrow roads. The cottage was at times chilly as we felt hesitant to use the heating. Double bed a bit too small for us. Great location. Absolutely loved the property and the location. Well equipped and spacious. Enjoyed the 'Winnie the Pooh' features that made it feel special. Could not criticise it in any way. We found Alice Cottage brilliant in many ways. It was in a very quiet location and only a 15 min walk to Blackpool Sands - a lovely privately owned shingle beach, incredibly clean and well looked after with really good facilities: life guards, highly rated cafe with good mix of traditional/vegi/vegan foods, kayak hire, beach shop and changing huts by the wc's. Costs a lot to park there (up to £8) however they did waive the fee for us if stopping for the cafe and not using the beach. A few mins drive took us to Dartmouth and the two car ferries, recommend park and ride for long stays if catching ferry to Greenways, etc, as town centre parking limited to 2hrs. The cottage was very well equipped with dishwasher, washing machine, separate tumble dryer, log fire and very good wi-fi which worked brilliantly with our chrome cast. It felt really homely with good quality furnishings and lots of interesting books, games, and up to date dvd films. We cooked in a few times and the kitchen was excellent with full sized double fridge & freezer, loads of pots, pans, everything we needed and more. There were loads of things to do locally, in fact too much for our 1 week there. Jubilee coastal walk stopping at Dartmouth Castle for lunch (park in NT car park a few mins drive from cottage). NT Greenways by ferry, holiday home of Agatha Christie. Ferry to Dittsham and Totnes. NT Coleton Fishacres by car ferry. Brownstone Battery by car ferry, a 2 mile round walk from NT car park, we saw seals from Froward Point Coastwatch Station. And of course Dartmouth and Blackpool Beach. A perfect cottage in a perfect location! It is very rewarding receiving such a review which confirms our own feelings that Alice and its proximity to Blackpool Sands, Dartmouth and other scenic & historical attractions can make for a memorable holiday. It is also testimony to the work of Maria & Richard who manage Alice that the property is in a welcoming and pristine state for guests arrival and who also ensure the property is well-equipped and provides a variety of homely family activities. Clean, well maintained, quiet location, near beach. Everything you need for an off the beaten track holiday. Ideal place to get out of the rat race! The property matched the description in all respects. Despite indifferent Spring weather, the cottage was warm throughout and spacious even for five adults. Customer service was excellent and the owners responded very quickly to all enquiries. Alice cottage was really well equipped and one of the best in this respect. The narrow access lanes need care but that is normal in Devon! I would recommend this property without hesitation. Radius 7 restaurant is new to us and the food and service was excellent if you like more imaginative dishes than normal pub food. Alice Cottage is situated in South Devon in the picturesque South Hams in a valley, a 10 minute drive from Dartmouth with one of the finest natural harbours in England, and a short walk from Blackpool Sands beach and its amenities overlooking which you will find views rivalling those of the French Riviera. Nearby attractions include Dartmouth Castle, Britannia Royal Naval Collage, Greenway, former home of Agatha Christie with gardens overlooking the River Dart and Coleton Fishacre, a National Trust house and garden. For children we recommend Woodlands, a family theme park and the Paignton & Dartmouth Steam Railway. Dartmouth hosts a music festival in early May and a food festival, in October. Its famous regatta is held at the end of August. The town has a cinema and theatre, craft shops, cafes and boutiques, including the Harbour Bookshop, once owned by Christopher Robin. Slapton Sands, with its D-Day connections and nature reserve, ideal for bird watching lies to the west. Blackpool Sands beach is consistently ranked one of the UK's top beaches with an excellent café, shop and water sports equipment for hire. Towels and sheets can be ordered at a charge of £12 per person per week. . Towels and bed linen charged at full week rate. From November-March £50 electricity included in rental. Additional electricity used for payment by guests. A deposit of £50 per week may be taken to cover electricity in winter months. Any booking over 30 days in the winter months electricity will be charged on a usage basis..